The College of Law’s J.D. 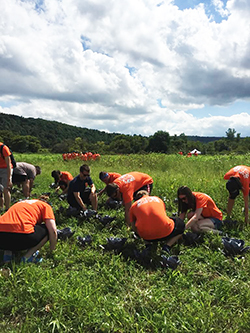 Class of 2018 wrapped up its week of orientation by completing a community service project where everyone spent several hours at a local farm harvesting produce for distribution to Central New York organizations. Incoming College of Law students harvest produce on a local farm as part of their orientation. The group, along with College of Law staff and student mentors, harvested over 1,100 pounds of produce and contributed to the farm through completing other chores, such as painting buildings. “The community service project is a way of introducing our incoming students to the importance of giving back to one’s community. The project supports the concept of law as a societal good, a cornerstone of the profession they will be joining,” says Tomás Gonzalez, senior assistant dean of student life. During the week, both the J.D. class and LL.M. Class of 2016 experienced a variety of seminars, meetings and events geared to prepare them for success in the next three years. It gave the students a number of opportunities to interact with each other, faculty, staff, current students and alumni.